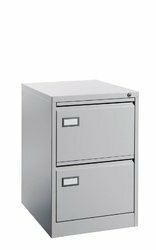 We are a leading Wholesaler of vertical filing cabinets from Pune, India. Full Extension Slides - Smooth telescopic, full extension, ball bearing drawer slide with anti rebound. Anti-tilt System - Anti-tilt mechanism allows only one drawer to open at a time preventing toppling of the cabinet. 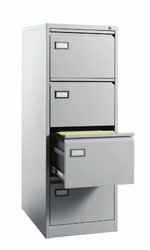 Index Holder - Easy identification for each drawer. For faster retrieval of files. 30 kg load carrying capacity.